As you know, I travel A LOT. I joke to my family and friends that sometimes I feel like my other job is a Flight Attendant--which is fine by me, because I LOVE me some Flight Attendants--especially those old school FABULOUSLY dressed ones form "back in the day". I actually love to travel. My dad was a diplomat and I grew up traveling--I was only 2 months old when I first got on an airplane in fact...Nowadays 99.9% of my travels are business--for my design business, or for filming and appearances. 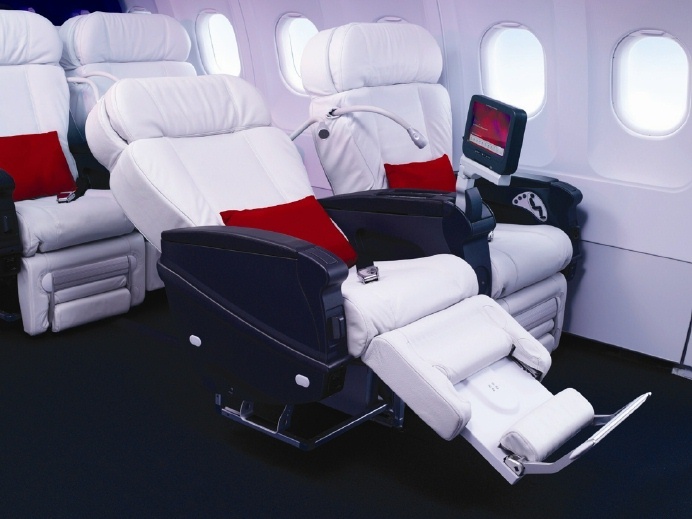 Sometimes, a client might be "extra nice" and book me on a "Premium Cabin" (Love that!) or I get lucky and receive an upgrade (Love that, Part 2!) 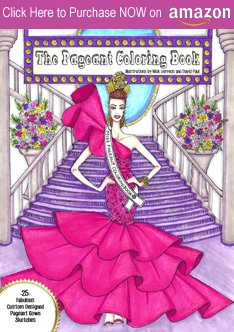 This post here on my lovely ol' blog is one of those stylish occurrences on a recent 4+ hour East Coast-West Coast flight on one of my favorite airlines, Virgin America. 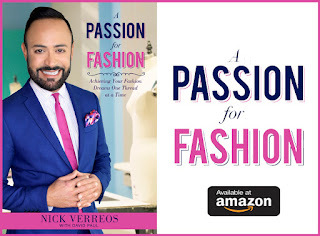 Virgin America is probably one of the most "stylish" US-based airlines; they're semi-new, they're flight attendants are younger and dressed a little more "hip" with their fitted white cotton shirts with adjustable sleeves, band collars. For bottoms, they wear either a slim pencil skirt with invisible zippers at the side seams and center back (to create a slit opening if wanted). Even the pilots are "business casual" in their black dress shirt (no tie), black pants look (no cap, no jacket). Last month, Virgin America even had a fashion show on a flight from NYC-LA, care of "Banana Republic" (photos above). Now, getting back to my "stylish" flight: I was booked on Main Cabin Select (Premium Economy) but somehow by the Airline Gods, I got a chance to upgrade to First for a (surprisingly) minimal charge. Done and Done, as they say! Welcome Aboard Drink: after taking my seat (see photo at top of post) and getting myself acquainted with the rather FAB white leather Recaro reclining seats (Can you say "Massage Function"!! 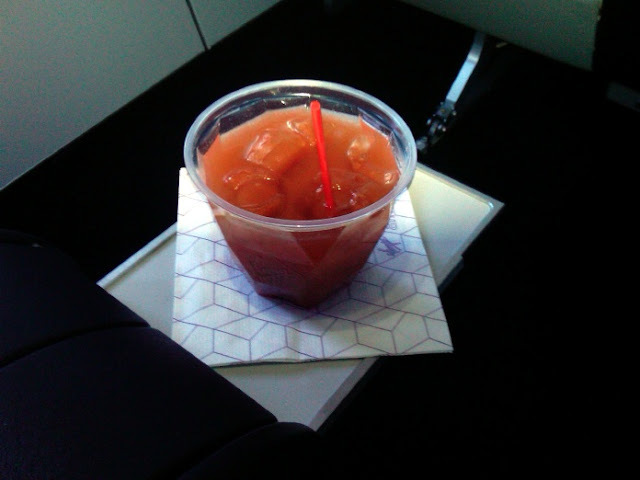 ), I was offered a "Welcome Aboard" drink...a Bloody Mary please. 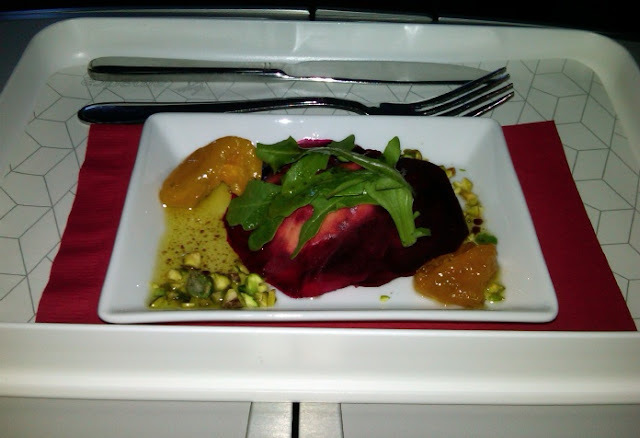 Soon after the plane reached cruising altitude, the first "Appetizer" course appeared: Beet Raviloi with fennel, pistachio, and goat cheese nougatine (what in God's name is a nougatine??). It was yummy! Dinner: Cuban Beef Chimichurri--described in the menu as "grilled beef filet topped with chimichurri and served on a ropa vieja of spicy chorizo sausage, tomatoes, onions, garlic, pigeon peas (say WHAT???) and rice". 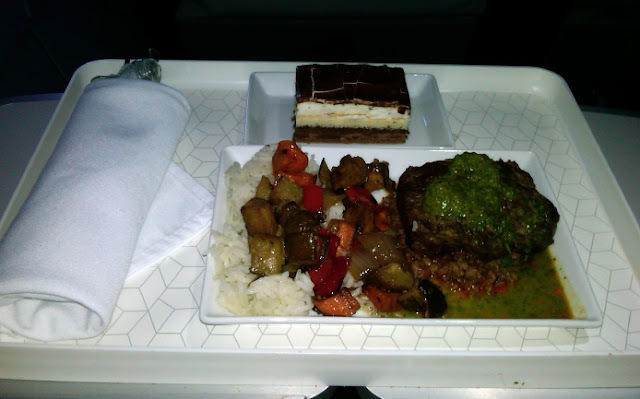 I ate it ALL (I was HUUUNGRY and happy to just be in First Class...so leave me alone!!). Dessert was a Chocolate Mint Pave'. I took one spoonful and decided that was all my body could take! I reclined my body on that aforementioned seat, watched a movie, dozed off and before I knew it, we were landing in LA. Next time I am munching on them pretzels back in Economy Class (wait, what pretzels?? ), I will pretend, I am having a Beet Ravioli starter and a Cuban Steak Chimichurri dinner...For sure! 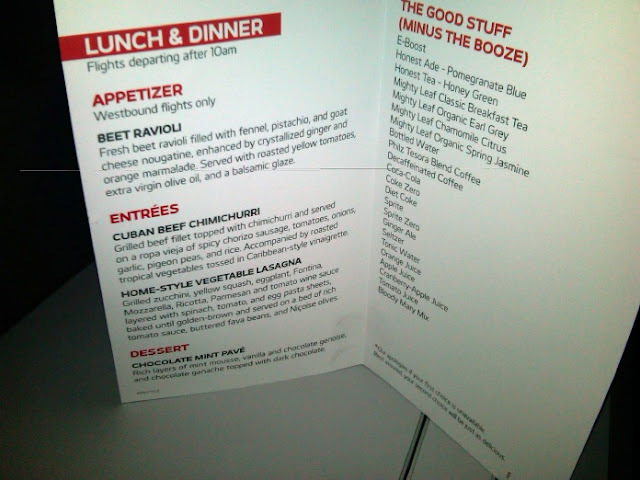 0 Response to "TRAVELING IN STYLE.....Dinner at 30,000 feet, Virgin America"